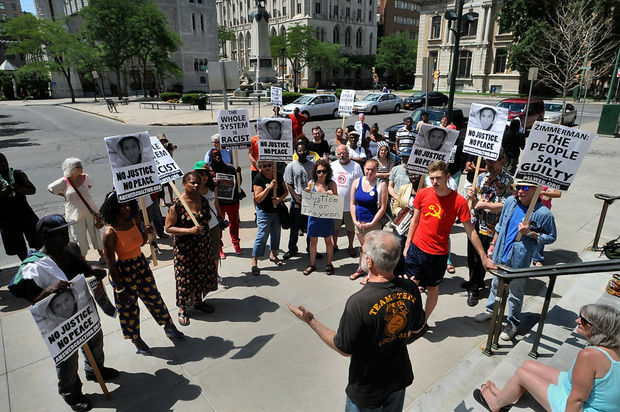 This month, Greens in New York joined rallies decrying the injustice of Trayvon Martin's death and the Florida "Stand Your Ground" law. The shooting of Martin and the enabling of "Stand Your Ground" legislation shows a dire need for the principle of Nonviolence in our communities, and Social Justice for people of color whom the law has deemed deserving of attacks by police and civilians alike. Read a statement from the Green Shadow Cabinet on the "shameful" verdict. Lynne Serpe, Green Party candidate for City Council in Queens, carries a flag during a march through the East Village. Also shown: Jack Baldwin, Candace Carponter, Daniel Saudade Lee, GPNYS Co-chairs Gloria Mattera and Michael O'Neil, and Chris Archer. Read Lynne Serpe's statement linking the Martin case to "Stop and Frisk" policies in NYC.